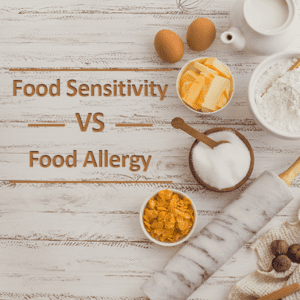 The Food Sensitivity / Food Allergy Package is a specialty package designed for clients who have been diagnosed with food allergies by a physician, or who suspect they may be sensitized to certain foods or to components of foods. As this is a clinical package provided from a Dietetic perspective, it is only available to those in Canada. Allergies involve the presence of antibodies and we use a combination of standard assessment tools and where appropriate, will work with your GP or local walk-in clinic to requisition allergy testing covered by MSP. I never request any expensive out-of-pocket blood tests, because there is no need. Requesting standard blood tests from your GP or allergist, it will be determined whether antibodies to specific foods or food classes are present and if they are, whether you are also sensitized to other foods that are ‘related’. If helpful, I can assist with referrals to local area allergist. As much as possible, I prefer to avoid having people eliminate whole groups of foods in order to determine if they are problematic (“elimination diets”). By approaching it systematically and in a step-wise fashion, together we are able to determine if certain foods may be problematic – in which case I’ll recommend eliminating certain foods for a period of time, while using a targeted food log (which I’ll teach you). I’ll take a complete history of symptoms at the first visit and if indicative of possible IgE allergy, I’ll provide you with a Lab Test Request form for up to 5 specific antigen serum IgE tests, that you can bring to your GP for a Requisition for standard tests that can be performed at a local area Lifelabs. If the results are positive, I’ll teach you about those specific food allergies, which foods to avoid and what foods are potential cross-reactants. If the results are negative, then subsequent visits will follow the same series of events as described on the web-page under the IBS package. If you plan on taking a Complete Assessment Package, it is recommended that this package be taken first so we can determine whether you are allergic to any foods, before I design a Meal Plan for you. Download and complete the Intake and Service Option Form available here and return it to me at the email address on the form with the times you are available for an appointment. If you would like a password-protected form, please send me a note using the Contact Me form on the tab above. I’ll send you confirmation of your appointment with an invoice for the package which you can pay in the Shop on line via credit or directly via an e-transfer made out to BBDNutrition Ltd. Note: When paying via credit card, the cost of services includes GST (5%). Have questions? Please send me a note using the Contact Me form.